Imagine roasted nuts and brown sugar rolled into a chewy ball, dipped into dark chocolate, and sitting on your plate. Not too sweet, with a sprinkle of sea salt rolled in. Time for a chocolate nut ball. This is another friend of a friend recipe. My friend Stephanie in Ottawa – yes, we were the two Stephanies – gave me this recipe from her friend Natalie. The recipe originally comes from Natalie's Ukrainian grandmother. Now that I’ve rolled some for myself, I can see why this recipe gets passed along. They are so nutty that I can justify eating one as a mid-morning snack tomorrow at work – much more exciting than a handful of plain almonds. And the chocolate drizzle . . . well, the chocolate drizzle will make me think it’s a special day, like a birthday or anniversary. Because it’s a good day indeed when I can find a way to eat chocolate and nuts before noon. A note: You can use any combination of nuts you like. I used 1 1/2 cups almonds, 1 cup hazelnuts, and 1/2 cup pecans. That all whirled up in the mini food processor to 3 1/3 cups. Preheat the oven to 300 degree Fahrenheit. Prepare a cookie pan with parchment paper. Roast the nuts for three minutes. Keep a careful eye on them to make sure your oven doesn’t run hot – nuts burn so quickly. Take the nuts out and turn the oven up to 325 degrees Fahrenheit. In a bowl, mix the ground nuts with the brown sugar. Sprinkle with sea salt to taste. Bake the balls anywhere from 9-15 minutes. After about 6 minutes, check the bottoms. They will be brown, but not burnt. While the nut balls are cooling, melt the chocolate in the top of a double-boiler. Cover a plate with parchment paper. 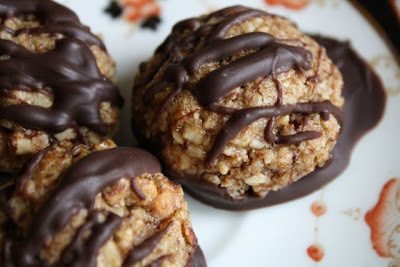 Dip the cooled balls in the chocolate and place them on the paper-covered plate. Use a small fork to drizzle more chocolate on top. Put the plate in the fridge for at least an hour until the chocolate has set and you can lift the balls easily off the plate. I have a question, if the bottoms are brown after 6 mins, should you take them out or must you still wait until you have reached 9 mins? Well, ovens can run a bit differently. If they're getting pretty brown, I'd say take them out before they burn. Hope yours didn't burn! 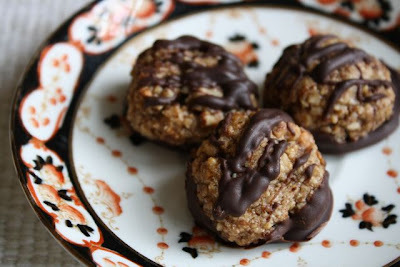 Stephanie - I just made these last night and they're addicting! Great recipe! I sprinkled a little bit of coarse salt on top of the chocolate coating and it makes them look a little bit "glisteny" - like freshly fallen snow, giving them a festive feel. It also ups the sweet/salty factor. So yummy! These are so great... I've made them a few times and I get requests all the time to bring them again.